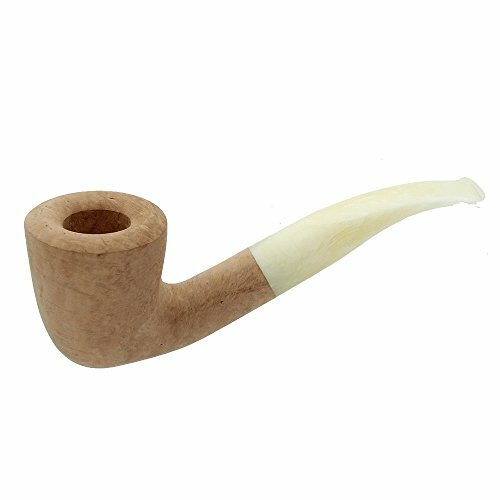 Beautiful unfinished briar tobacco pipe with a colorful red and black acrylic stem. Acorn shaped bowl. Pipes are unfinished and can be sanded, filled, and stained to the pipe smokers desire! Pipes may vary slightly from picture in finish and dimensions. Approximate measurements: Pipe Length: 5.25 inches. Bowl Height: 2.00 inches. Outer bowl diameter: 1.6 inches. Inner bowl diameter: 0.77 inches. Bowl chamber depth: 1.66 inches. These pipes are non-filtered.